Scientifically accurate and easy to read, this no-nonsense handbook gives the most balanced, objective information available on the most often used and abused drugs, from alcohol, caffeine, and nicotine to heroin and Ecstasy. 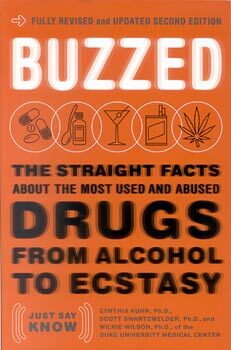 Whether the reader is a student confronted by drugs for the first time, an accountant reaching for his fourth cup of coffee, or a health educator, Buzzed will provide a clear understanding of how drugs work and the consequences of their use. Before Buzzed, little information had been made accessible to the general public on the most current psychological and pharmacological research on drug use--and even less that was not distorted by anti-drug hysteria, leading many people, especially young people, to distrust any official pronouncements. Neither a "Just Say No" treatise nor a "How to" manual, Buzzed is based on the conviction that people make better decisions with accurate information in hand. "We are led to believe that our college students have all the facts about drugs and are simply making high-risk choices. However, those of us working in higher education know this is not always the case. Students need clear, detailed, comprehensive factual information in order to make smart decisions, and Buzzed provides it all in an easy-to-understand format. What a great resource!" -- Ellen Gold, Director of University Health Services, Eastern Michigan University. "Buzzed is one of the most important books I've ever read . . . so comprehensive and so readable that I recommend everybody who's interested in this area -- kids who are taking drugs, parents, professionals working in the drug sphere, and, most of all, politicians and legislators -- to read it."